Ketton's Shakir Mahmood bowls Newborough's Dave Stratton. Photo: David Lowndes. A sensational spell of swing bowling from Shakir Mahmood propelled Ketton closer to promotion to Rutland Division One last weekend (July 31). Mahmood dismissed five Newborough batsmen in five balls, three at the end of one over and two more with the first two balls of the following over. Ketton's Shakir Mahmood just fails with this caught and bowled attempt in the Rutland Division Two hammering of Newborough. It’s a rare achievement for the all-rounder. It’s never happened in first-class cricket. Mahmoood’s spell caused Newborough to collapse from 74-2 to 81 all out and set Ketton up for a 10-wicket win, a result that catapulted them 84 points clear in Division Two! Four Newborough men were out for ‘golden ducks.’ Mahmood finished with fugures of 7-33. 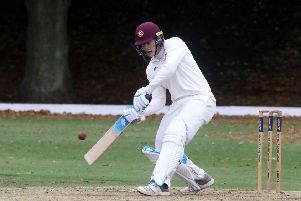 It was an excellent weekend all round for Ketton who had scored a shock 70-run win at Saffron Walden in Cambs Division One 24 hours earlier. Mahmood (54 & 2-34) again played well as did Peter Rowe who took three wickets and ran two opponents out, one with a direct hit from the boundary line. Ketton have another tricky Cambs League match on Saturday (August 6) when travelling to Godmanchester. They take their perfect record in Rutland Division Two to Castor the following day.